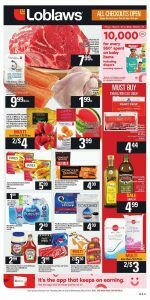 Loblaws Flyer Weekly Flyer 23 Mar 2019 contains special deals only for this week. Do not miss the must-buy part of this flyer. Because of you impossible to find those prices anywhere else. If you want, you can check Walmart flyer, Loblaws flyer, no-frills flyer, FreshCo flyer, and the other flyers and see what is the difference. All meat varietis on sale, also you can find healthy ready meal trays on fresh rayon. Visit the Loblaws and realize all good things. Trust me you will be happier about shopping from Loblaws. With special prices and delicious foods, you will love it! Loblaws Flyer Weekly Flyer 23 Mar 2019 is a perfect choice, if you are saving your money. Let’s discover all good deals and pick your favorite of this week. This flyer valid until next Wednesday, so you have time to pick yours!